The ideas behind Epic Mix seem very cool — recording vertical, connecting you to friends on the mountain in this most social of sports — but how do you think it will really change the ski experience for the average skier at one of the Vail Resorts? Thank you, we are very excited to be able to provide this new experience for Vail Resorts guest this ski season. Skiing and snowboarding have always been about sharing your experiences on the mountain and talking with friends and family the great runs you took or remembering a powder day. 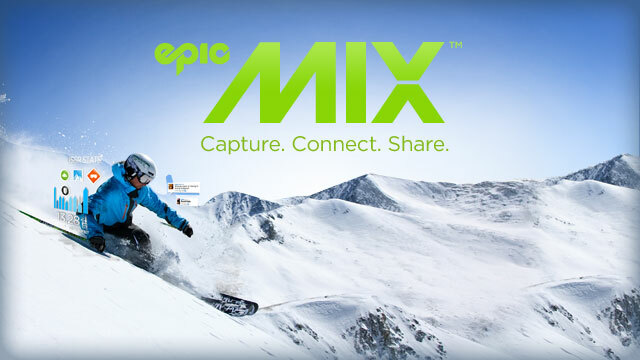 EpicMix marries the very real “social” experience of skiing and riding with the fun and sense of sharing created by location-based social media, making it accessible to everyone. The basic functionality of EpicMix does not require Vail Resorts’ guests to do anything but ski and ride as they always have. There is nothing to buy, nothing new to wear and no required check-ins with their mobile devices. The application is embedded into Vail Resorts’ existing season pass and hard card PEAKS lift tickets using radio frequency technology. The readers are installed at the 89 lifts across Vail , Beaver Creek, Breckenridge, Keystone and Heavenly. In fact, a guest may not even notice these readers on the mountain. EpicMix can be used by any guest at whether they purchase a season pass or a PEAKS single day lift ticket. By not requiring our guests do anything new, EpicMix is accessible to everyone, not just those already familiar with social media and at the end of the day you can log onto www.epicmix.com to check out what you accomplished that day in the way of vertical skied, number of days skied, pins achieved through unique accomplishments on the mountain and also compare your ski day with your friends on Facebook. How does the connectivity part work — does this function like Twitter, where you can assemble a group of your buddies — and maybe add someone you meet on the mountain or apres ski? Yes, EpicMix allows guests to share their statistics and accomplishments through updates on Twitter and Facebook and guests can create special EpicMix leader boards with their Facebook friends. If a guest opts in, the EpicMix mobile application alerts guests when any of their Facebook friends are skiing and where they are on the mountain and Parents will also be able to use EpicMix to track the lift rides of their kids in real time. Also, if a guest receives a new pin, the application can automatically update your Facebook or Twitter status on your achievements on the mountain. Guests at our resorts can also use EpicMix to send messages to their private groups of Facebook friends on the mountain and plan to meet up, talk about the runs they’ve skied, where they snow is or whatever they choose. The mobile application will also provide trail and grooming information, snow and weather reports, as well as resort news and traffic updates. What’s the next step — is there video to come, or some other way to archive your ski season? For this ski season we’re focused on the current offerings and features of EpicMix. However, we are already looking at ways to enhance the application and experience for our guests for next ski season. Whether it’s installing mobile readers on the mountain to track specific trail runs or conduct treasure hunts for kids as well as attaching photo and video functionality for our guests to have even more ways to share their ski experience with friends and family online. Is this an exclusive Vail Resorts product — or will we see it (and can we use it) at competing mountain resorts down the line? Currently this is an exclusive Vail Resorts product and only guests skiing and riding at Vail, Beaver Creek, Breckenridge, Keystone and Heavenly resorts can use EpicMix. However, we are open to working with other resorts interested in adding this functionality.